Story from the FIA Foundation. 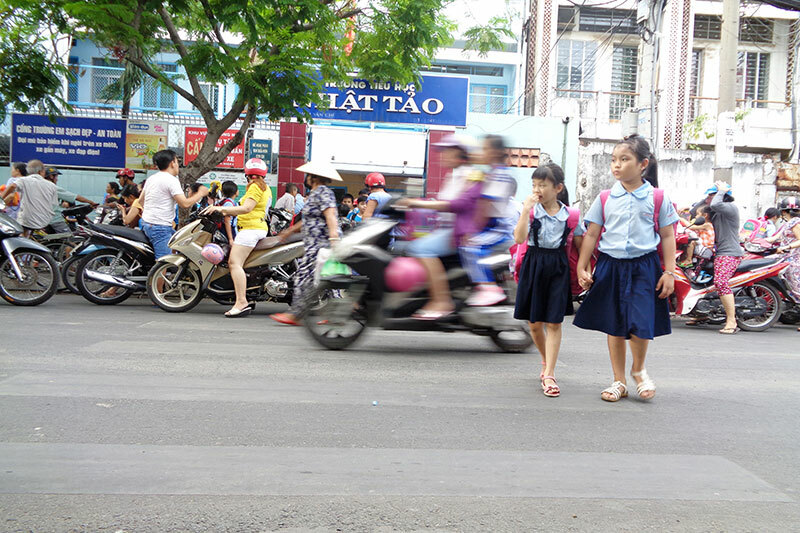 The new pedestrian safety plan in District 6 of the Vietnamese city will provide new safety measures for primary and secondary schools along the new Bus Rapid Transport (BRT) corridor and feeder roads. The plan will ensure zebra crossings and sidewalks are constructed on every road around schools in the BRT zone and will also repair potholes, tile pavement networks, and provide signposting in further measures to protect pedestrians. Ho Chi Minh City is constructing its first BRT system as a part of the HCMC Green Transport Project, financed by the World Bank. AIPF, along with other road safety organisations, identified that while the BRT corridor will expand public transport options, it is also likely to bring new risks for pedestrians, especially children. To better understand the current and potential future road safety challenges, AIPF conducted a comprehensive baseline study of 37 primary and secondary school zones located along the BRT corridors in Districts 1, 5, and 6, to identify challenges to pedestrians. The research used surveys to identify road safety knowledge and behaviour, as well as conducting in-depth interviews, and pedestrian behaviour video observation. The school zone assessments identified a range of challenges, including the absence of pedestrian warning lights, traffic lights, or traffic calming measures. More than half of all parents surveyed reported safety as the main reason their children were not allowed to walk to school alone (51%). All parents surveyed believed that there should be more information and understanding of pedestrian safety and stronger enforcement of traffic laws. Improvements to sidewalks were considered necessary by over 94% of parents and the installation of traffic lights and road signs reduce vehicle speed around school entrances were favoured by 97% of respondents. AIPF made a series of recommendations based on its research, presented to Ho Chi Minh City’s Traffic Safety Committee (TSC) and Department of Transport (DoT). These suggested elements included a series of road design measures to improve safety for child pedestrians and recommendations for communication materials to improve road safety knowledge and behaviour. These recommendations were adopted People’s Committee of District 6 in Ho Chi Minh City, the executive body that makes decisions related to education, public safety, and infrastructure, in the region of the city, and are now reflected in the District’s new pedestrian safety plan.